With a focus on customer relationships, Atlantic Aviation’s new facility at Portland International Airport, opening in 2017, will continue the company’s goal of providing the upmost in user experience as a gateway to their destination. With Northwest accents that fit into the Oregon landscape, JRMA designed this inviting facility that displays an intentional balance of luxury and functionality. The FBO welcomes departing guests under a porte cochère of arched, wooden beams, while an airside entrance canopy of the same material leads arriving guests into Portland. 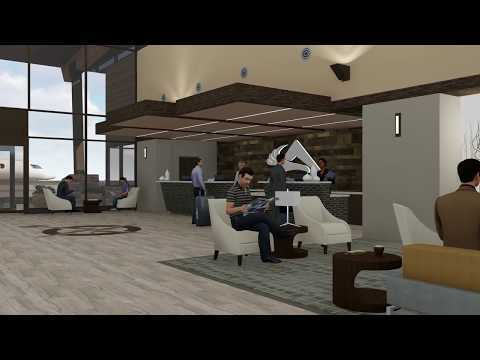 Other wood and stone details bring out the Northwest’s character while also providing lounges, office space, access to technology, and anything else travelers need for ease and comfort. The two wing-shaped hangars with support office/shop areas flank both sides of the FBO, providing a dynamic contrast to the arched shaped FBO. A fuel farm, a renovated building to house ground support equipment fill and abundant ramp space and vehicular parking fill out the over the balance of the 14 acre leasehold.